Learning from failures and incidents is essential in a lean and cost effective organisation and is often a fundamental requirement in regulations. However, incidents should not be seen in isolation as the broader view and key industry learnings might get lost. DNV GL has investigated over 2000 incidents and failures globally, identifying trends among the data and invites the oil and gas industry to join and share experiences. To further strengthen DNV GL’s global lab capabilities for failure investigation, a new lab in Bergen is opening, including one of the world’s largest tensile testing machines. As the oil and gas industry strives for cost effective execution in projects and operations while maintaining a high focus on safety and environmental footprint, innovative and smart solutions are needed more than ever. By extracting data and knowledge from all the detailed incident investigations performed over the years, solutions might be just around the corner. DNV GL now invites industry partners to join an industry project (JIP) to identify and have access to updated trends based on a broad range of data, including failure mechanisms, root causes, materials and equipment. The benefit for the industry will be a systematic approach to capturing and sharing learnings from past failures and for the JIP partners to exchange experiences. JIP participants can also use the knowledge as decision support in early phase developments, and risk based inspection. 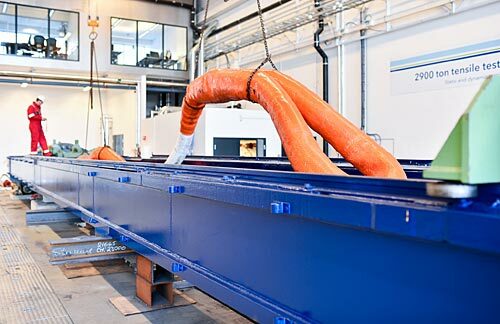 “Supporting our global laboratory network, the DNV GL technology centre for materials, corrosions, coatings, offshore mooring and lifting in Bergen has new laboratory premises with superior infrastructure so that our customers can have standard or tailored tests to suit their needs and get test results faster. This will further strengthen our position within offshore mooring and lifting and materials- and corrosion technology. The most powerful test rig will have a capacity of 2900 tons which places DNV GL’s Bergen lab among the top test sites in the world,” adds Tørstad. DNV GL has a long, proven track record of demonstrating how incident investigation knowledge can be turned into industry guidance and benefits. One of the examples is when DNV GL conducted a number of failure analyses where the cause of failure was hydrogen induced stress cracking (HISC) in duplex materials installed sub-sea. Based on in-depth materials investigations and root cause analysis of these failures, DNV GL gathered the industry in a joint effort to solve the problem. DNV GL quickly established a guideline for safe use of duplex materials, which re-established confidence in using duplex as subsea materials. Recommended practice DNV-RP-F112 Design of Duplex Stainless Steel Subsea Equipment Exposed to Cathodic Protection has become the global industry standard to avoid HISC. Similar outcomes have come from failure analysis on fasteners, thruster gears, hydraulic piston rods and anchor damages of pipelines. DNV GL will call for an industry meeting in November 2016 to provide further information around the failure- and root analyses development program and the opportunities to join the industry project.